When Baltimore native Adam Milam discovered that he could use science to keep youngsters away from violence, alcohol, tobacco and other drugs, he got hooked on research. 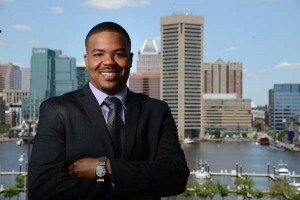 The Baltimore City College graduate with a bachelor’s degree, master’s degree and Ph.D. from Johns Hopkins Bloomberg School of Public Health has fueled new legislation through findings from his doctoral dissertation—included in a 2012 Rolling Stone story about “The Wire” actress Felicia Barnes—showing the role liquor stores play in childhood health and safety. “The research that I have conducted with my colleagues at Hopkins and University of Maryland have helped to increase taxes on little cigars, improve enrollment in health insurance and is currently being used to re-write the zoning code for Baltimore City,” he said. The 29-year-old said he found his niche in the research lab as an undergraduate at Johns Hopkins University, and enjoys tackling big problems, learning every day. “I am surrounded by Nobel Prize winners, international scholars and individuals that make ‘Saving lives, millions at a time’ a reality,” Milam said. He is pursuing a career as a residential anesthesiologist focusing on substance abuse intervention with plans to work himself out of a job. His first job was as a camp counselor at the Police Athletic League Center on Pennsylvania Avenue where he said he learned the impact of early and simple health interventions. Now, he counsels, mentors and teaches college students how to research.